The 2017-2018 flu season proved to be unusually virulent, spurring Dr. Dan Jernigan, director of CDC's influenza division, to remark in a statement to the media in January, "flu is everywhere in the U.S. right now." It resulted in a record number of hospital admissions and, sadly, the highest number of report pediatric deaths since the 2014-15 season. "The 2017-2018 influenza season was a high severity season with high levels of outpatient clinic and emergency department visits for influenza-like illness (ILI), high influenza-related hospitalization rates, and elevated and geographically widespread influenza activity for an extended period." Even though viral infection this past season was abnormally high, it’s too soon to predict whether the 2018-2019 flu season will follow suit. Typically, the U.S. experiences annual epidemics of seasonal flu. Most of the time, flu activity peaks between December and February but can last as late as May. It's also hard to know whether new strains will circulate as flu viruses change constantly. Every year, CDC monitors certain key flu indicators and provides weekly updates in its "FluView Influenza Surveillance” report. 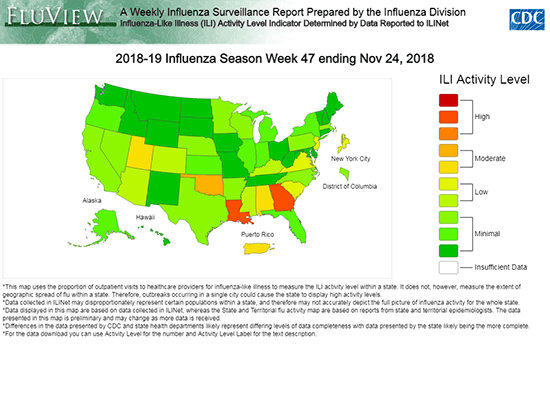 The latest report — ending the week of November 24 – shows that influenza activity has increased slightly, partly due to a reduction in routine healthcare visits during the Thanksgiving holidays. Twenty-one states reported regional or local flu activity, while 28 states, the District of Columbia, Puerto Rico, and the U.S. Virgin Islands continue to report only sporadic activity. Influenza A and B viruses continue to circulate, with influenza A(H1N1)pdm09 viruses reported most commonly by public health laboratories since the end of September. Baloxavir marboxil (trade name Xofluza®) is a new influenza single-dose antiviral drug approved October 24, 2018, by the FDA. 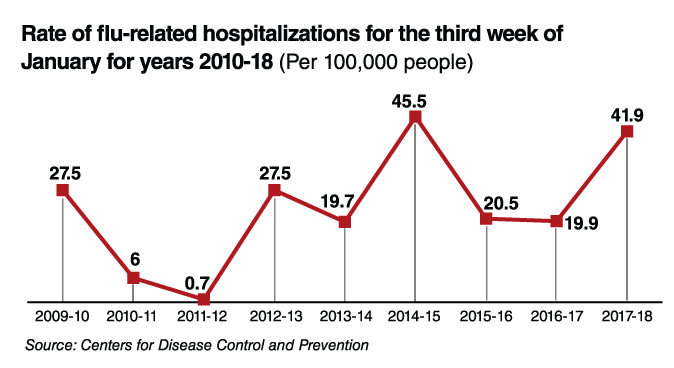 Hospitals and healthcare workers still have plenty of time to prepare for the upcoming season, to minimize its virulence and spread, and that starts with getting vaccinated themselves. The CDC Advisory Committee on Immunization Practices and the Healthcare Infection Control Practices Advisory Committee both recommend that all U.S. healthcare workers get vaccinated annually against influenza. That includes not only clinicians but also any staff employed by the hospital or other healthcare facilities (e.g., clerical, dietary, housekeeping, laundry, security, maintenance, administrative, billing, and volunteers). “Even those employees not directly involved in patient care could be exposed to infectious agents that can be transmitted to and from healthcare workers and patients,” CDC says. Of course, annual vaccination is also the first (and best) preventative measure for anyone, not just healthcare workers. 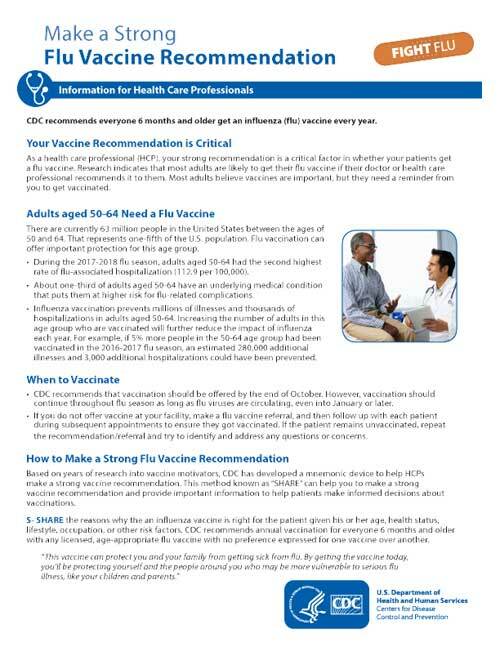 CDC recommends that routine annual influenza vaccinations be administered for everyone six months and older with any licensed, age-appropriate flu vaccine with no preference expressed for one over another. CDC also offers several toolkits clinicians can use to prepare patients for the flu season. These include fact sheets, a patient flyer, appointment reminder, and sample social media content. Flu vaccination coverage estimates show that few people get vaccinated against influenza after the end of November. 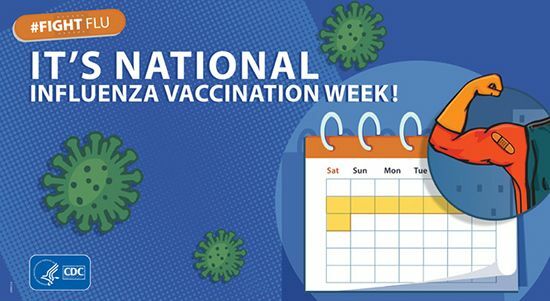 In response, CDC established the National Influenza Vaccination Week (NIVW), in 2005, to highlight the importance of vaccination through the holiday season and beyond. This year, NIVW is December 2-8, 2018. The CDC website lists several resources clinicians can use during NIVW to make patients aware of the need for vaccination, including a flu vaccine finder, digital toolkit, videos, and other resources. Even though it’s too early to predict what the 2018-19 flu season holds in store, some level of outbreak will occur. Whether it reaches epidemic proportions is anyone’s guess. The best way for hospitals, healthcare workers, patients, and the public at large can stem the tide is through vaccination. Clinicians should lead by example and get vaccinated early, and then use the array of materials available in the CDC toolkits and NIVW materials to inform their patients of the need. For more information about what you can do to prepare for the upcoming flu season, visit the influenza section of the CDC website.